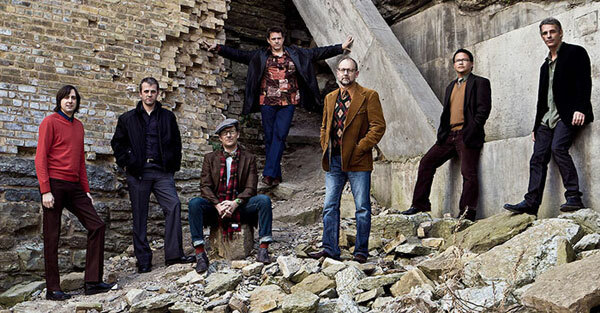 Trampled By Turtles to Headline Day Two on July 8! Trampled By Turtles will be donating all proceeds from their performance to flood relief efforts, as will all the other acts on the second day of the festival. After the Saturday fundraising goal for the Music Resource Center is met, all net proceeds from the first day will go to flood relief efforts as well. The money raised will go to a United Way fund for long term flood relief that was just announced today, routing money raised directly to the people that need it most. The kids activity tent from Saturday will turn into a flood relief tent for Sunday to house organizations looking for flood relief volunteers. Sunday tickets go on sale here at 10 a.m. on Tuesday, June 26 for $35. Saturday is the same price and both days of the festival can be purchased for $60. The Sunday lineup includes Lucy Michelle & the Velvet Lapelles, Trapper Schoepp, Solomon Witherspoon, Sarah Krueger (moved from Saturday), Hobo Nephews of Uncle Frank, Mary Bue, Matt Ray & Those Damn Horses and The Boomchucks. 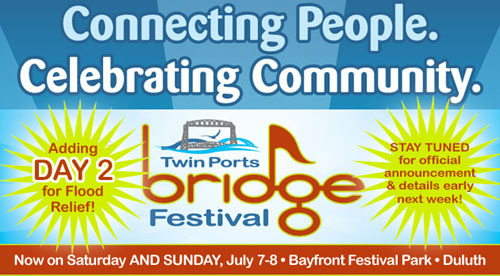 The mission of the Twin Ports Bridge Festival has always been to unite the community under a dynamic entertainment experience. After the flood, it now serves as a fundraiser to kick off many other community-building events, some of which are already being planned. Email laugh@laughingstockdesign.com to get involved in this extraordinary celebration of regional musicians and communities coming together around this cause. And don’t forget to thank our hometown heroes, Trampled By Turtles, the next time you see them for making it all possible! Big announcement coming early next week!